Why not have your reception, corporate event or seminar in Grade 1 listed splendour at Abbot's Hospital? Our panelled Guesten Hall can be used for a variety of events and is available Monday - Saturday from 9.00am to 9.00pm. The Guesten Hall seats up to 60 people concert style and can accommodate 32 people seated. Cost: £150 for the first 2 hours (minimum charge) and £60 per hour thereafter. We add on a locking up fee if the lock-up is after 9 pm at night. Click to view: Our Photo Gallery. 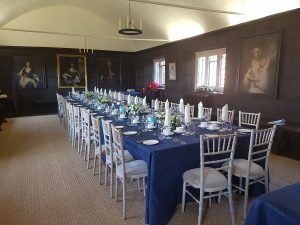 The Common Hall is also available for hire, it contains 17th century refectory furniture and is able to accommodate up to 40 people standing. Cost: £100 for the Common Hall for the first 2 hours (minimum charge) and £50 per hour thereafter. chefian.biz (Chef Ian at Caterease Ltd 07939-010177). To find out more about availability and cost contact: master@abbotshospital.org. © Copyright Abbots Hospital. All rights reserved.